Note 2: The tool is still considered alpha, so you should be a bit careful when running commands that modify or delete information in live environments, e.g. try it out first in a non-critical environment. Note 3: The tool is also available as a stand alone WPF application. To use it, you need to download the source from the CodePlex site and build it. 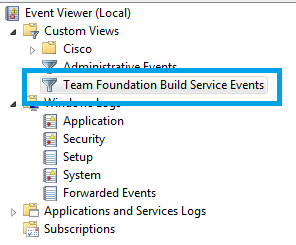 This will bring up a new tool window that will by default show all build definition in the currently selected team project. You can easily filter on specific team projects and/or build controllers. Note that all columns are sortable, just click on the header column to sort it ascending or descending. 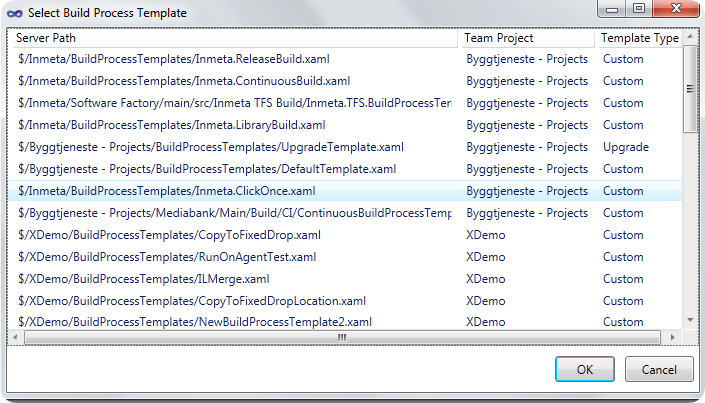 This makes it easy to for example locate all build definitions that use a particular build process template, or group builds by team project etc. 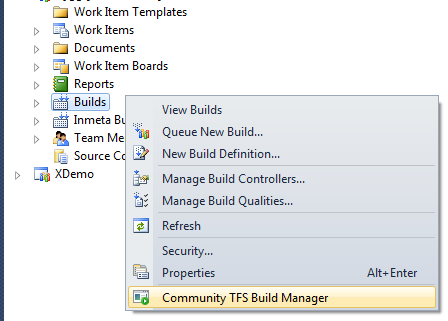 delete several build definitions in TFS and there is no way to do this in Team Explorer. 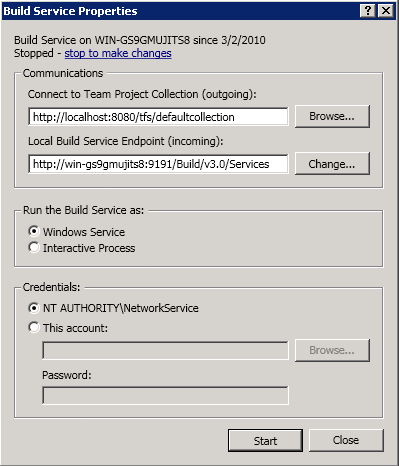 This will queue a “default” build for the the selected build definitions. This means that they will be queued with the default parameters. 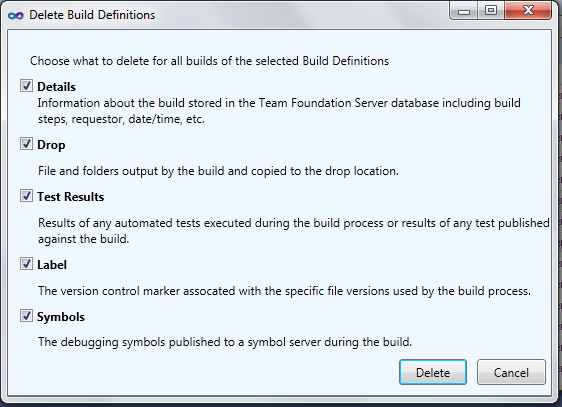 This lets you delete one ore more build definitions in a single click. 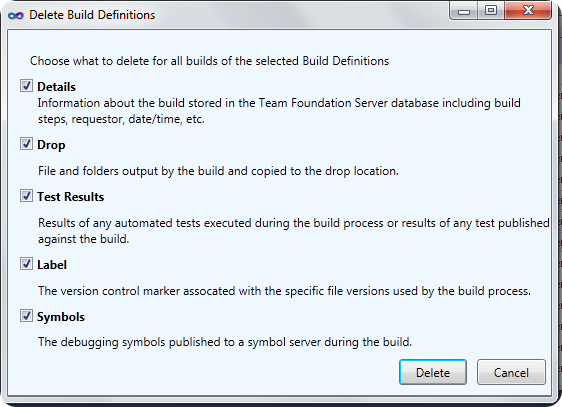 In Team Explorer this is not possible, you must first delete all builds and then delete the build definition. Annoying! Allows you to set retentions policies to several build definitions in one go. Note that only retention policies for Triggered and Manual build definitions can be updated, not private builds. 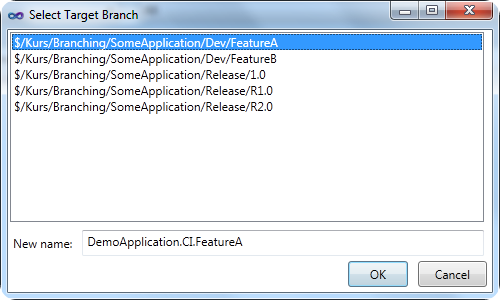 When select one of the target branches, the new name will default to the source build definition with the target branch name appended. Of course you can modify the name in the dialog. After pressing OK, a new build definition will be created and all the parameters listed above will be modified accordingly to the new branch. 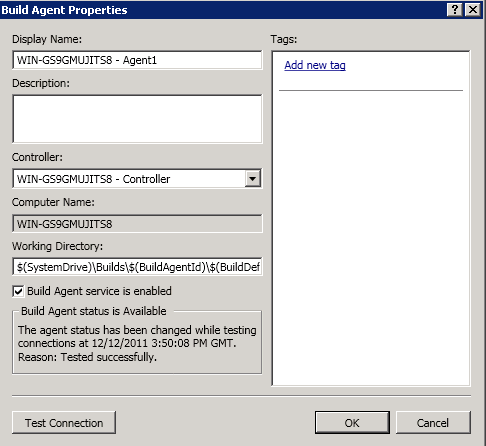 This will delete all artifacts of the build (details, drops, test results etc..). 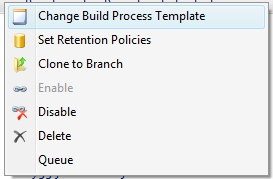 It should show the same dialog as the Delete Build Definition command, but currently it will delete everything. Set one or more builds to be retained indefinitely. The dark green boxes are the host machine names and the controller and agents are contained within them. 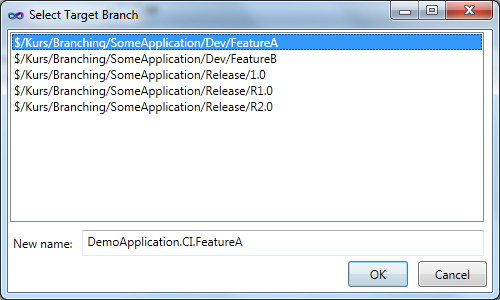 Note: Currently the only way to view DGML files are with Visual Studio 2010 Premium and Ultimate. 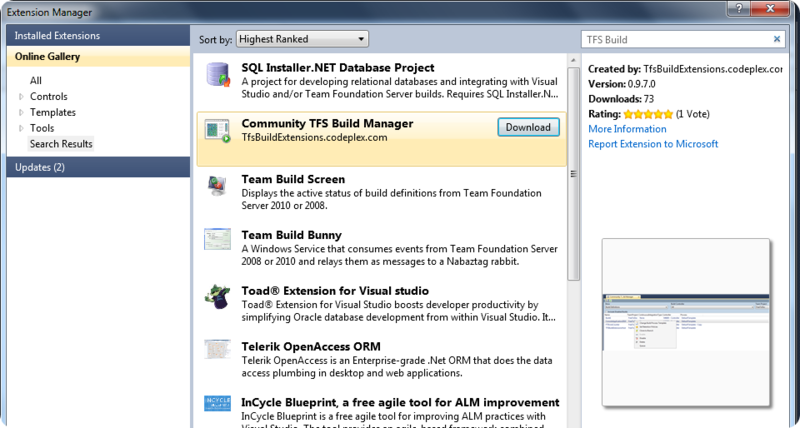 I hope that many of you will find this tool useful, please report issues/feature requests to the Community TFS Build Extensions CodePlex site! I often use the VS 2010/TFS 2010 evaluation virtual machines that Microsoft publishes every 6 months with the latest bits. It’s a great timesaver to use an image where everything is already setup and also contains a bit of sample data that is useful when you want to demo something for customers. 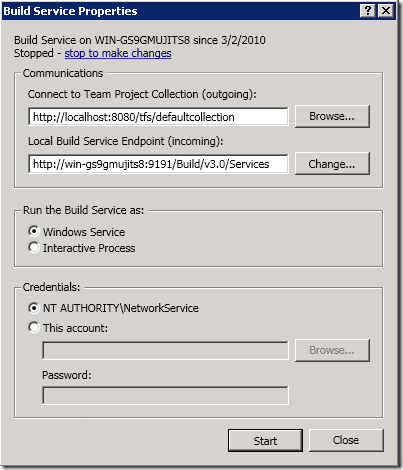 Press Start to start the build service with the new credentials. If you would queue a new build now, the build would fail because of conflicting workspace mappings. 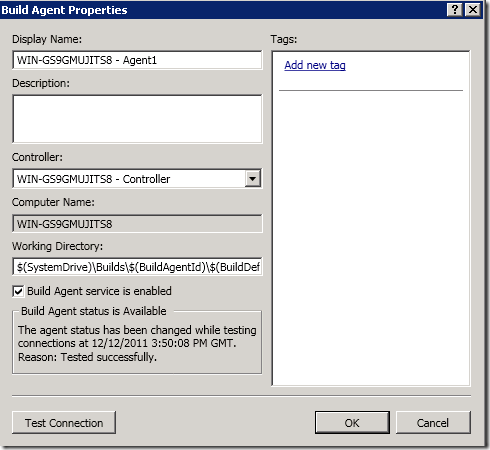 The reason for this is that we haven’t changed the working folder path for the build agents, so when the build agent try to create a new workspace, the local path will conflict with the workspace previously created by NT AUTHORITYSYSTEM. In this case, you can for example change it to $(SystemDrive)BuildsNS$(BuildAgentId)$(BuildDefinitionPath) where NS = Network Service. 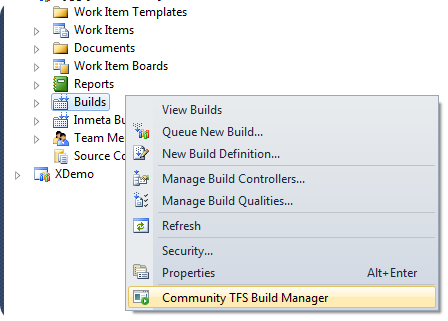 Author Jakob EhnPosted on December 12, 2011 Categories TFS Build, Visual Studio 2010Leave a comment on TF237165: Team Foundation could not update the work item because of a validation error on the server.